There are around 173 small hydropower plants (SHPP) in Armenia, of which around 114 are on natural streams. The license for these SHPPs is given for about 15 years. The electricity producers sell the electricity to “Electric Networks of Armenia” CJSC for around 11-25AMD (2-5 US cents kilowatt/hours). They do not however pay minimal taxes for water usage which used to go to the community budget before. 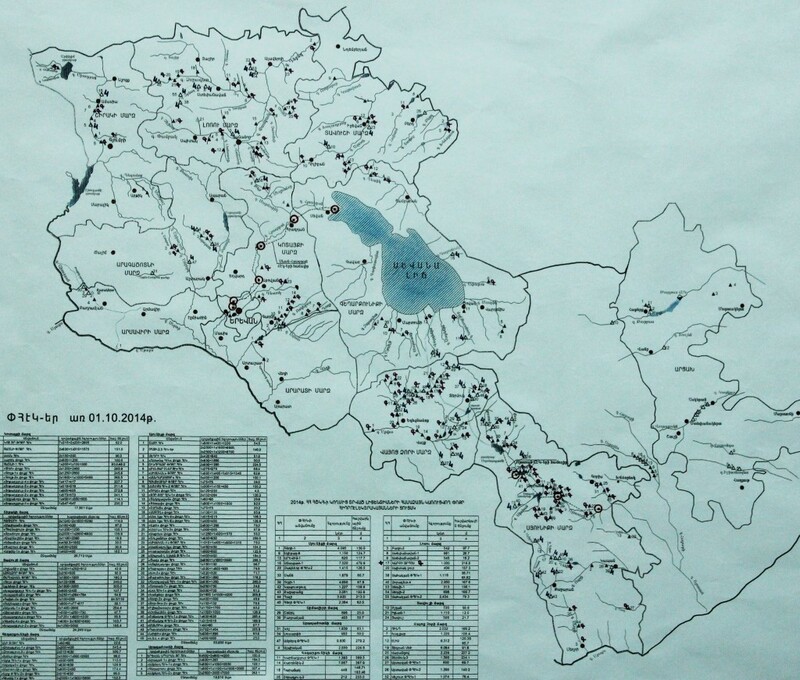 Moreover, the documents that regulate SHPP sector are 50-60 years old and there has been no updated assessment of water resources in Armenia. The SHPPs operate without limitations using the maximum available water flow in the rivers, thus the water in the rivers is mainly directed for the operation of the plant. This obviously deteriorates the ecology of the river. For example Yeghegis river, which hosts 11 SHPPs (additionally 6 SHPPs on its tributaries and 4 additional being in construction phase) has changed its composition in the past years. As Inga Zarafyan, head of Ecolur informational NGO describes the situation, Yeghegis is no longer a river but a cascade of hydro power plants. According to data provided by Environmental Impact Monitoring Centre of Ministry of Nature Protection, trout, an endemic fish species down the stream of the river, has now disappeared. This is caused by the SHPPs on the river. The profits from these plants are so attractive that SHPPs have been built even on rivers in specially protected areas. For example, Lake Arpi and its environment have the status of national park. However, since SHPPs were built on Akhuryan river that feeds this lake, the latter is now drying out. It is particularly interesting that KfW German development bank supported the creation of the “Lake Arpi” National Park. Meanwhile, it also actively supports construction of SHPPs. Other international and local banks that give loans for construction of small hydropower plants in Armenia are European Bank for Reconstruction and Development (EBRD), World Bank, local Ameriabank, Central Bank of Armenia through its German-Armenian Fund. European Investment Bank has as well shown interest in this sector. State agencies admit that the construction of some of the SHPPs are illegal, however, no one attempts to stop them. Member of Standing Committee on Agriculture and Environment of National Assembly, Lyova Khachatryan announced during a press-conference that SHPPs have become a real threat for the nature and environment in Armenia as licenses are given without even a prior economic assessment. The SHPPs might thus be profitable for one or two persons but the whole economy loses a lot more. He stressed that Armenia has turned into a dump and a mining center. Specialist in aquatic ecosystems, Seyran Minasyan also highlighted that SHPPs are a threat for our rivers as they take more water from rivers than is permitted. Examples include the dire situation of Yeghegis, Amberd rivers and the similar fate awaiting for Meghri river. He mentioned that although the chemical composition of the river doesn’t change, the hydromorphology and hydrobiology of the whole river changes. At the same time the calculation methods of the amount of environmental flow (amount of water that is left in the river for preservation of ecology after construction of SHPPs) dates back to Soviet period which results in very little environmental flow in the river not enough for the ecosystem. Environmental groups have tried in the past to invite representatives from banks and foundations to discuss the situation. However, the latter have been absent from suchlike meetings. According to Inga Zarafyan this is mainly due to the fact that they take care only of the technical aspect of the project, while environmental section is missing: these funding bodies only pay due regard for potential profits, no expertise has rejected any of the SHPPs, even the projects violating laws have been approved. Several monitorings carried out by the environmental NGO Ecolur in the past have stressed some of the serious problems among which are insufficient environmental flow and absence of environmental flow management systems that would control to what extent the plant complies with the permitted amount for environmental flow. In the past Ministry of Nature Protection carried out monitoring of three SHPPs and found out that the flow is either not enough or is almost absent there. Functional incompliance of fish pass ways and fish-protecting nets are another problem that have eventually resulted in loss of fish biodiversity in the rivers. Ecolur NGO also mentions another problem connected with SHPPs – the cumulative effect of the SHPPs on the river – as often one river may host up to several plants. Since it is easier to construct SHPPs following the first plant, the result has been rapid increase of SHPPs on the same river after the first plant was built. Often 30 percent of the river is taken into a pipe for operating a SHPP. Overload of Yeghegis river alone is 51percent. According to official statements, this river has lost its natural features: only in three years its oxygen amount has decreased while its temperature has increased. The usage of old or insufficient equipments in some of the plants is also a source of deterioration of the environment as for increasing their productivity, the plants take more water from the rivers for their operation than permitted. SHPPs also have negative impact on politics: They are dragging Armenia behind on the ladder of democracy since many of the SHPPs violate number of laws, including their incompliance to the requirements of Law on Environmental Impact Assessment, violation of Codes on Water and Forests, Laws on Specially Protected Areas of Nature, Laws on Flora and Fauna, Law on Lake Sevan. According to Inga Zarafyan, the department of Ministry of Nature Protection that gives permissions for water use and issues conclusions on environmental expertise, works non-transparently: it doesn’t provide environmental organizations with the protocols of public hearings, conclusions of environmental expertise, etc. Meanwhile, international financial institutions according to her are interested in 100 percent loan repayment, not in environmental protection and socio-economic situation of the specific country. Zarafyan mentions several cases of violations of laws, such as the construction of SHPPs in buffer zones of “Khosrov Forest” and “Shikahogh” state reserves, “Sevan”, “Dilijan”, “Arevik” national park areas, “Jermuk Hydrological Reserve, “Yeghegnadzor”, “Getik”, “Arjatkhleni” and “Ijevan” reserves and in Dsegh and Gugarq forestry enterprises. Since 2012 there is a bill on the agenda of the National Assembly that intends to amend the RA Law on “Lake Sevan” banning the construction of SHPPs on the rivers that flow into Lake Sevan. The bill however hasn’t been selected by the National Assembly for voting yet. Moreover, SHPPs contain threats of landslides since they are constructed without prior assessment of the crisp soil and landslide processes in the area. Intensive construction, blasts, pipe and road placement are often accompanied with deforestation eventually activate landslide processes. Additional serious effect of the SHPPs is the deterioration of the socio-economic state of local residents who are often deprived of irrigation and drinking water. This in its turn decreases agricultural production which is often the main source of income for residents. However, no SHPP project has an impact assessment for the living conditions of the local populations. Meanwhile, many SHPPs have caused tension in communities whose meadows, pastures, gardens and recreation zones are directly linked with these rivers. The means of subsistence of these residents that depend on animal husbandry, horticulture, apiculture, ecological food production and local tourism is thus diminished. They do not benefit from SHPPs in any way, not even in terms of getting cheaper electricity, since the law on “Energy” in Armenia declares that all produced energy is sold to “Electric Networks of Armenia” CJSC. Often this becomes a reason for corrupt processes, since SHPPs are often built without public hearings (like the case of Byurakan, Meghri), with the decision of the heads of the villages who in their turn cooperate with SHPP owners. This in its turn is another regress in democracy records of Armenia. According to UNFCCC National Focal Point Aram Gabrielyan, today’s economic system is aimed at fast and vast consumption of natural resources. He stresses that SHPPs are just a business, whose owners invest and in 5 years time they get their investments back. The remaining time of operation of the plant brings them excessive profits. This has nothing to do with public services therefore this sector should be removed from the area regulating public services. He mentioned that while “Electric Networks of Armenia” CJSC buys electricity from “Vorotan” HPP (one of the main power generation complexes in Armenia owned by the state) for 2 AMD for 1kwt, it buys electricity from SHPPs for 20-25AMD. The law in its turn states that even if there is no need for electricity, electricity produced from SHPPs should be bought. Thus, the operation of “Vorotan” HPP is periodically stopped to buy electricity from SHPPs. Meanwhile according to reports that have not been refuted so far, some of SHPPs are owned by political figures such as the President’s brother, a former Attorney General, the mayor of Vanadzor, Members of Parliament, the former Head of Water Resources Management Agency of Ministry of Nature Protection, a former Head of Armament Unit of Armenia’s Armed Forces, Primate of Vayots Dzor Diocese, former Prime-Minister’s son-in-law, former Minister of Agriculture and more. Meanwhile, in the past years electricity prices have increased by 40 percent. Thus not only the environmental state is worsened by the operation of SHPPs, but also violation of laws and corrupt processes in this sector are boosted as a result. The civil society and environmental groups have some suggestions for improving the situation that can be found here and here. By funding projects that aggravate the deterioration of the local environment and the socio-economic state of the communities, international and local financial institutions, parallel to the government, get involved in violating human rights, as well as contributing to the regress of Armenia’s economy and democracy.